Peer pressure can be tough for kids to resist, even if it comes from robots. School-aged children tend to echo the incorrect but unanimous responses of a group of robots to a simple visual task, a new study finds. In contrast, adults who often go along with the errant judgments of human peers resist such social pressure applied by robots, researchers report August 15 in Science Robotics. "Rather than seeing a robot as a machine, children may see it as a social character," says psychologist Anna-Lisa Vollmer of Bielefeld University, Germany. "This might explain why they succumb to peer pressure [applied] by robots." 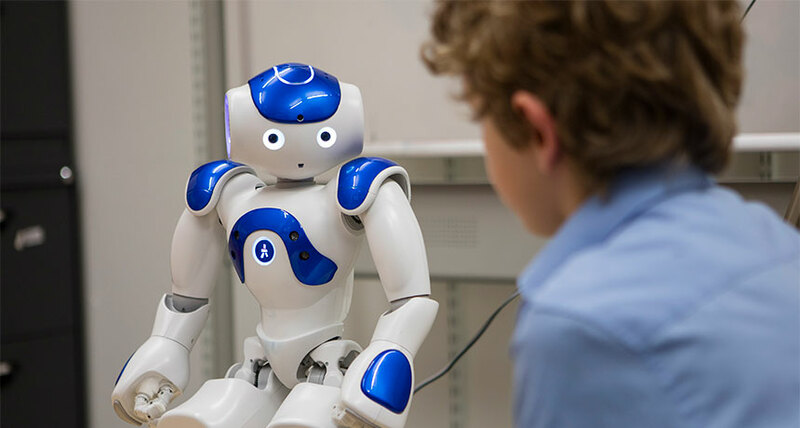 Little is known about how either adults or children respond to the behavior of lifelike robots designed to interact with people, for example, as museum tour guides, child-care assistants and teaching aids. In a preliminary examination of the influence of social robots, Vollmer's group adapted a 1950s social psychology experiment in which most adults agreed with groups of peers who had been coached to say that lines of different lengths were in fact the same length (SN Online: 5/15/18). Vollmer's team observed comparable social conformity in a study of 60 British adults, ages 18 to 69, who judged line lengths after hearing the opinions of three peers who were working with the researchers. Participants usually endorsed peers’ unanimous, inaccurate judgments. Conformity vanished, however, when volunteers performed the task while sitting with three robots that, on some trials, agreed on an incorrect answer. Each robot was programmed to make periodic movements, such as blinking its eyes and briefly gazing at others. Robots spoke with distinctive, individualized voice pitches when making line judgments. When children sat with the robots, though, the kids frequently went all-in. The study's 43 participating British grade-schoolers, aged 7 to 9, agreed with three-quarters of the robots' unanimous, inaccurate answers. The kids did not participate in conformity experiments with trios of same-age human peers, given the difficulty of getting youngsters to act convincingly according to researchers' directions. Still, larger samples of volunteers are needed to confirm that kids usually cave to social pressure from robots. Cultural factors, such as being raised in a society that emphasizes individualism or group values, also may influence how people of all ages perceive and react to social robots. Three unresolved issues in particular stand out, says psychologist and child development researcher Paul Harris of Harvard University. First, it's unclear whether some robot behaviors, but not others, triggered conformity in children. A bot's periodic head turns toward a child, for example, might sway that youngster's choice more than the same robot's eye blinks or finger movements. It's also unclear why adults who bent to human peer pressure reversed course with robots. Finally, Harris asks, "Would fine-tuning of the robots' repertoire [of movements and vocalizations] eventually elicit deference even from adults?"